Hot, boiled water is an ancient Ayurvedic cleanser that flushes pollutants, accumulated during the night, out of the body. In the morning, bring one liter of water to boil for 5 to 10 minutes. The first cup should be consumed on an empty stomach and the rest enjoyed in small sips throughout the day. It is recommended to pour the water into a thermos flask . There's nothing wrong with enjoying a cup of coffee in the morning, since it brings the metabolism in gear. However, the body tolerates the intake of coffee better after having eaten. The main meal of the day should be always be consumed at noon. The "digestive fire" is most active during this time. During the evening, enjoy something light, at least three hours before retiring for bed. From the Ayurvedic perspective, the resting during the afternoon is wise, as long as one does not fall into a deep sleep. This deprives the body of the deep sleep needed at night. Never eat until you are "full"
One third of the stomach should remain empty. This is not only good for your figure, but also for concentration. Two-thirds of the stomach is filled, when two palmfuls of food has been consumed. It is good to set aside some time for yourself at least once a day. This may range between 30 to 60 minutes. The ideal time frame is either in the morning at 6-10 o'clock or during the evening at 18-22 o'clock. Our body loves regularity. Sleeping, eating, being active and passive at the same times during the course of the day keeps the body at teh least stressful level. 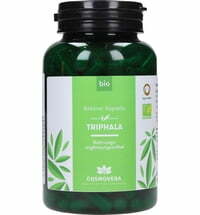 It is an Ayurvedic preparation that is made from three fruits and therefore also known as the "three fruit". 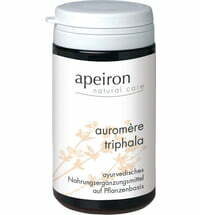 Triphala aids in digestion, excretion and detoxification, while being very gentle on the body.